Once upon a time, there existed a village that was completely inhabited by blind people. One day, an elephant came to the village. Since none of them had ever seen an elephant before, they all gathered around the animal to figure out how it looked like. The man who touched the trunk said: "An elephant is like a thick tree branch". "No! It’s like a pillar," said another who touched the leg. "You’re both wrong! ", said a third who touched the tail, "the elephant is like a rope." "Oh No! ", shouted another who was feeling the belly, "it’s like a wall"
And a man who was touching the tusk said "Come on, guys! The elephant is nothing but a solid pipe". They began arguing and fighting, and each of them insisted he was right. They were getting agitated and frustrated at each other. A wise man was passing by the village, when he heard the shouting. He stopped and asked: "What’s the matter?" So they told him that they could not agree about what an elephant was, and each told him what he thought it looked like. The wise man smiled and said: "
All of you are right. you all had different images of what an elephant looked like. doesn’t mean that the other person’s image of the elephant is wrong. An elephant has all the features that you described, and much more. 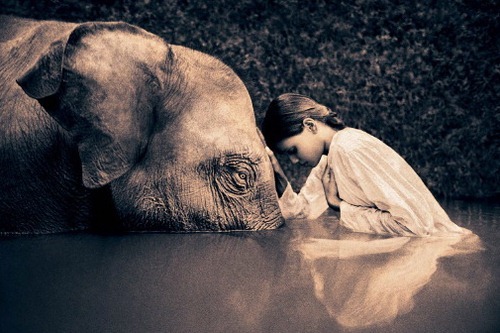 But you can never tell what an elephant is by just touching one part of it." Let’s not forget that each of us is looking at a different version of reality; a small aspect of life that’s colored with our own perception and experiences. The more we accept to see life through other people’s perspective, the richer version of it we will have. Good one! and good translation from Iranian poet Molana jalal ad-din Mohammad balkhi or Jalal ad-Din Muhammad Rumi (1207–1273), is a 13th century, was a Sufi poet, theologian and teacher who was born in Persia (now part of Afghanistan) and died in Konya (present-day Turkey). Rumi’s importance crosses cultural and national boundaries.